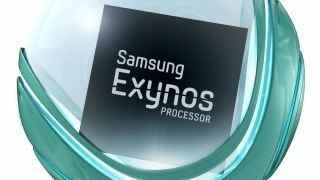 New details have come to light on Samsung's Exynos 5 Octa mobile processor, providing possible graphics processing unit specs for the chipset announced during CES last week. According to an AnandTech report, the octo-core chip will use a PowerVR SGX 544MP3 GPU, running at 533Mhz. This further separates the Octa from its Exynos 5 Dual predecessor, which is built with ARM's Mali-T604 GPU. The Dual is said to support WQXGA 2,560 x 1,600 resolutions that can best the Retina display found on the new iPad - though perhaps not beat the Apple tab in raw processing power. With a PowerVR SGX 544MP3 GPU, the Exynos 5 Octa is a step up from Apple's A5X chip in the third generation iPad, which used a GPU based on the PowerVR SGX 543MP4. The Exynos 5 Octa's GPU has a slight edge though, in part due to twice as fast triangle setup and DirectX 10 class texture support. Of particular note is that the Octa GPU clocks in at 533Mhz. For comparison, Apple's A6 GPU in the iPhone 5 runs at 266Mhz while the new iPad's A6X GPU clocks in at around 300Mhz. This means that while the Exynos 5 Octa might not quite match the new iPad's GPU in terms of raw power, but it could still provide a smoother experience for graphics intensive apps like gaming. Of course, the raw tech is one thing, but the real question is how well developers will be able to use the performance. Graphics showpieces are more rare on Android given the variety of devices, so that extra clock speed will come in handy more than a raw power bump.